On Sunday mornings at 7 a.m., Anne Sischo and her husband drive an hour and a half to New Era Field from Jamestown, New York, where they spend all day tailgating and even have elaborate dinners with 50 to 60 other Bills fans. Shortly after they arrive, Sischo greets her friends with homemade cookies that she bakes for each game. Sischo and her husband tailgate until the team starts warming up, which is when they head to their seats to spend time with friends who’ve turned into family. This routine may feel familiar to the Sischo family because they have been making the trip for the past 27 years. They enjoy the company of their friends in the stands, as well as on the field. Since their seats are in the first row, they have come to know the camera crew as well. They have been featured on television and in commercials many times and always get their photos taken. The Sischo duo truly feels at home when coming to Orchard Park. However, the memories they’ve made at Bills games extend far beyond the action on the field. The Bills are a huge part of the family’s life and something they have always looked forward to. Sischo stressed this significantly when she explained that she is a breast cancer survivor. During her courageous battle with the disease, Sischo, who had routine treatment appointments on Thursdays, still attended games on Sundays. “It would help me get through everything, it was really a good thing to look forward to,” she said. It’s things like this that make being a Bills Season Ticket Member so enjoyable for Sischo. Last year, she was honored on the field as a breast cancer survivor. Of course, Sischo also likes using her Bills Bucks Card, which gives her a discount at The Bills Store. However, the most meaningful perk of being a Season Ticket Member is her supportive and dedicated account representative. The Buffalo Bills would like to thank Anne for her many years of being a loyal Bills Season Ticket Member and our Season Ticket Member of the Month for the month of June. In addition to Anne being selected as a Season Ticket Member of the Month, she will receive a club seat upgrade, an autographed item and select Bills merchandise. Bills fans, the 2018 season is around the corner and what better place to watch all the action than live at New Era Field? Individual game tickets are now available to the general public for purchase. Additionally, group tickets (12 or more) are on sale. If you are interested in taking advantage of our discounted group pricing, please call our Ticket Office at 1-877-228-4257. Don’t miss out on the fun! Get your tickets now by clicking here. Beginning today, Monday, May 7, at 12 p.m., fans who have downloaded the My One Buffalo mobile application can take advantage of an exclusive presale offer on individual game tickets. Located in the Bills section of the app, fans can then select the offer displayed in the menu. The presale will conclude tomorrow, Tuesday, May 8, at 10 a.m. To take advantage of this special offer, as well as gain access to the other perks associated with the My One Buffalo app, click here. Through this presale, fans can purchase up to 11 tickets. Additionally, starting May 8, at 9 a.m., group tickets (12 or more) will be on sale. If you are interested in taking advantage of our discounted group pricing, please call our Ticket Office at 1-877-228-4257. 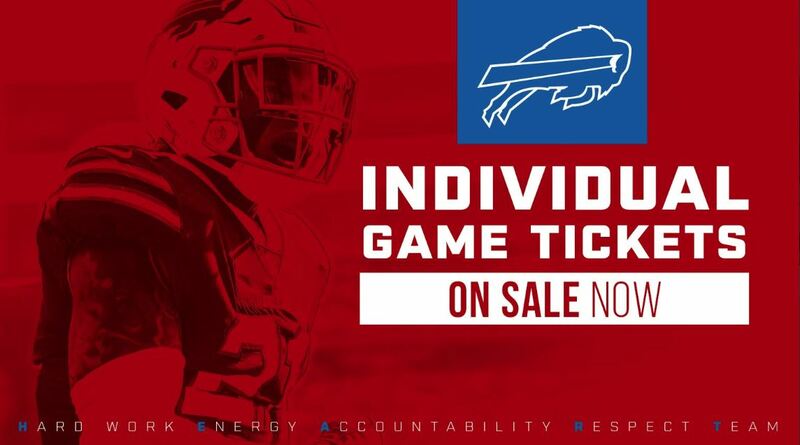 Individual game tickets will also be available to the general public for purchase on May 8, at 12 p.m.
For more information on Bills tickets, click here. Bills fans, mark your calendars! Not only have the Buffalo Bills released the 2018 schedule, presented by Ellicott Hotels, they’ve also announced individual game ticket information. 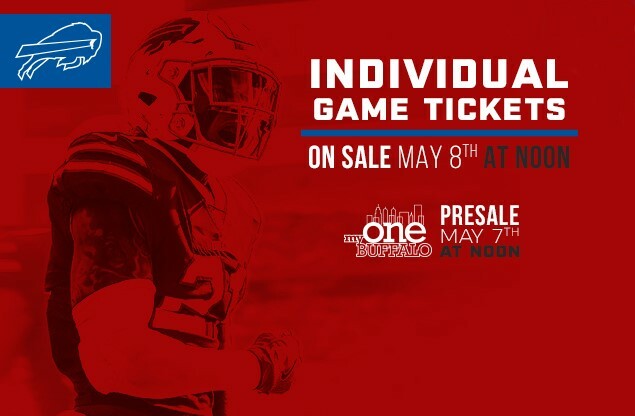 Beginning on Monday, May 7 at 12 p.m., fans who have downloaded the My One Buffalo mobile application can take advantage of an exclusive presale offer on individual game tickets. The presale will conclude the following day, Tuesday, May 8 at 10 a.m. To take advantage of this offer, as well as gain access to the other perks associated with the My One Buffalo app, click here. On Tuesday, May 8 starting at 9 a.m., group tickets (12 or more) will be on sale. If you are interested in taking advantage of our discounted group pricing, please call our Ticket Office at 1-877-228-4257. 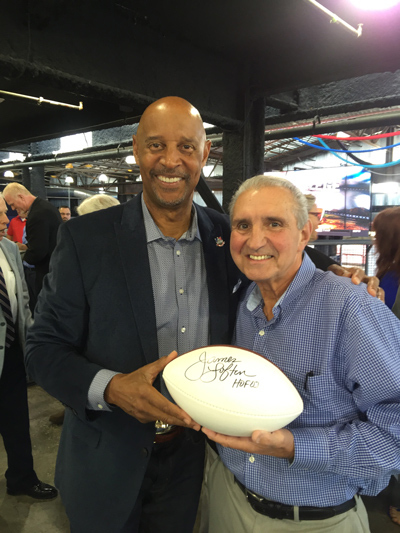 Individual game tickets will also be available to the general public for purchase on May 8 at 12 p.m.
Saxon Graham, an Orchard Park native, has been proudly supporting the Buffalo Bills for over five decades. After a stint away from the region, Graham, who had season tickets in the 1960s, renewed his membership during the 1998 season and has had them ever since. Although he currently lives in Florida, Graham still makes time to come home and cheer on his favorite team. From the old Rockpile, to New Era Field, Graham has witnessed Bills history unfold and made many lasting memories over the years. His journey as a fan has featured many highlights, including attending Buffalo’s first game in Orchard Park after the team relocated. Coming up, Graham and his wife will add a new chapter to their Bills fandom as they attend the 2018 NFL Draft in Dallas. Selected by the Bills as the Season Ticket Member to represent the organization at the event, Graham will join other members from around the NFL for the Season Ticket Member Draft Experience program. 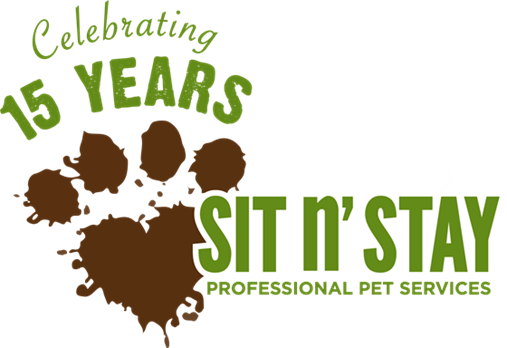 Each year, the initiative gives the chosen members an opportunity of a lifetime. Complete with a chance to walk down the NFL Draft Red Carpet on opening night, the group also gains additional behind-the-scenes access, including an up-close look at all the action. Graham, who is excited to show off his Bills pride, can’t wait to see what happens. The Buffalo Bills would like to thank Saxon for his many years of being a loyal Bills Season Ticket Member and our Season Ticket Member of the Month for the month of April. If you’re driving by New Era Field this evening, you’ll notice that the towers which surround Buffalo’s home playing field are lit red, white and blue. The gesture is a show of support for a group of 50 local veterans who will travel from Buffalo to Washington, D.C., on Saturday, April 14, on a special Buffalo/Niagara Honor Flight hosted by M&T Bank and the Buffalo Bills Foundation. The group, which is made up of World War II, Korean War and Vietnam War veterans, will make its way to D.C. to visit several national memorials built to commemorate their service. Traveling with the veterans are eight volunteers from M&T Bank, as well as Bills o-linemen Ryan Groy and Dion Dawkins. In addition to the lights at New Era Field, the community will notice several other buildings donning the patriotic colors. On Saturday evening, to welcome the veterans home, M&T Bank, The Electric Tower, City Hall, Peace Bridge and Niagara Falls will also be lit red, white and blue. Longtime Bills fan Jim Russo, has been a valued Season Ticket Member since 1970. Nearly five decades of proudly supporting his favorite team has allowed him to make countless memories. From the Comeback Game, to Buffalo’s Super Bowl appearances, Russo has cherished his time as a Bills fan. Over the years, Russo has enjoyed getting to watch many different players take the field. While his current favorite is cornerback Tre’Davious White, Russo’s all-time favorite Buffalo Bill is special teams ace Steve Tasker. 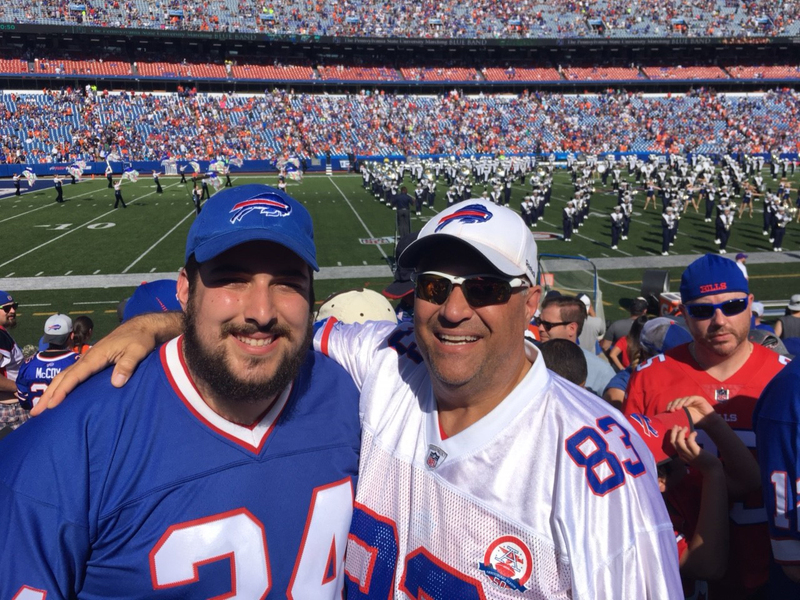 For Russo, attending Bills games is about spending quality time with family and making new friends. Additionally, Russo has come to appreciate the perks associated with his membership, such as his personal Account Representative. “If I need something, it’s nice to know that there’s someone there,” Russo explained. The Buffalo Bills would like to thank Jim for his many years of being a loyal Bills Season Ticket Member and our Season Ticket Member of the Month for the month of March. In addition to Jim being selected as a Season Ticket Member of the Month, he will receive a club seat upgrade, an autographed item and select Bills merchandise. St. Patrick’s Day makes me want to… SHOUT! Bills fans, feeling lucky? What better way get excited for St. Patrick’s Day than by singing every Buffalonian’s favorite song. Whether you are on the train or at the parade, start the Shout song for a chance to win Bills merchandise. Enter to win prizes by following the on-screen instructions on the Buffalo Bills Facebook, Twitter and Instagram pages. Conditions apply, please view the Official Contest rules by clicking here. 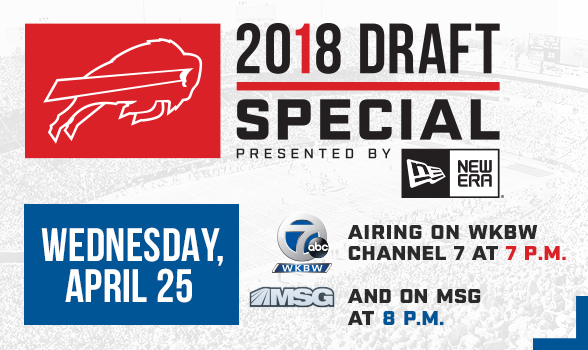 Bills fans, the 2018 NFL Draft is quickly approaching, which means you’ll once again have a chance to predict who Buffalo will select first! Predict the Pick, presented by M&T Bank, gives fans a fun and exciting way to share their thoughts on the Draft by choosing the prospects they think will land with the Bills. 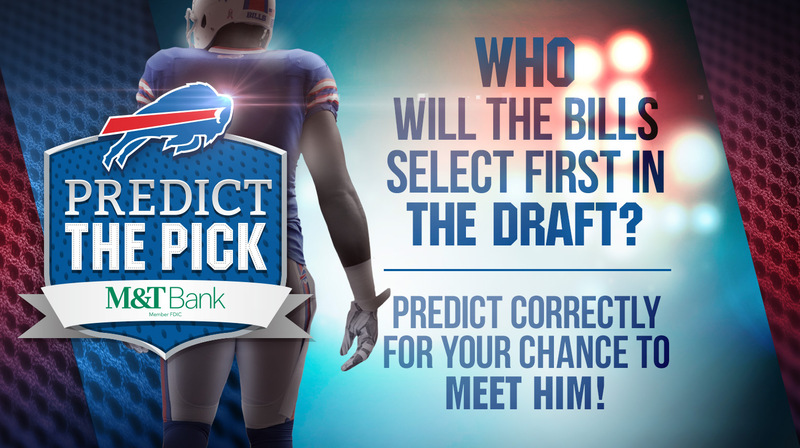 The fans who correctly predict Buffalo’s first pick, will be entered for a chance to meet him. To make your pick, click here. 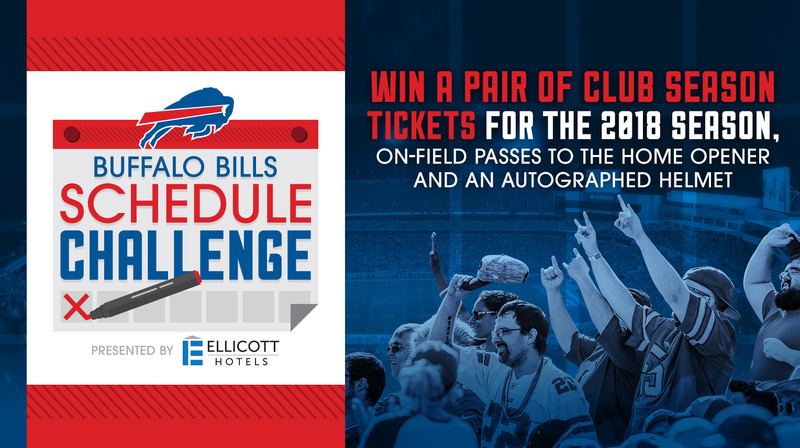 The contest will remain open until Wednesday, April 25 at 11:59 p.m.
Bills fans, the 2018 Schedule Challenge, presented by Ellicott Hotels, is back! The annual contest, which officially opened today, Feb. 26, gives Bills fans an opportunity to weigh in on Buffalo’s 2018 season schedule. Fans who take the challenge will be entered for a chance to win a fun prize pack which includes, a pair of 2018 Club Season Tickets, on-field passes to the home opener and an autographed helmet! 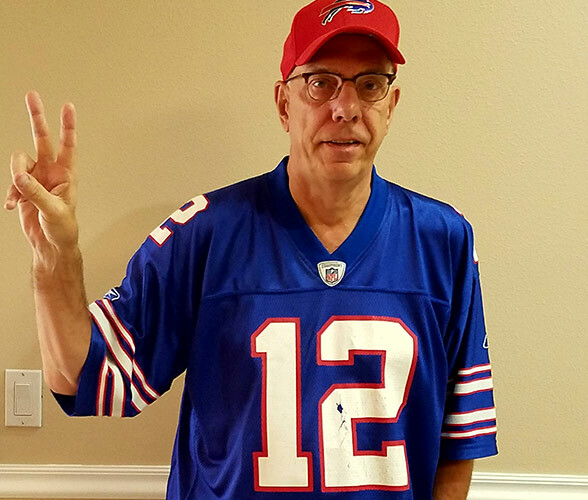 The Schedule Challenge will remain open until Saturday, March 31 at 11:59 p.m.
Nicholas Penna, a Hilton, New York resident and longtime Bills fan, has been a valued Season Ticket Member since 1991. 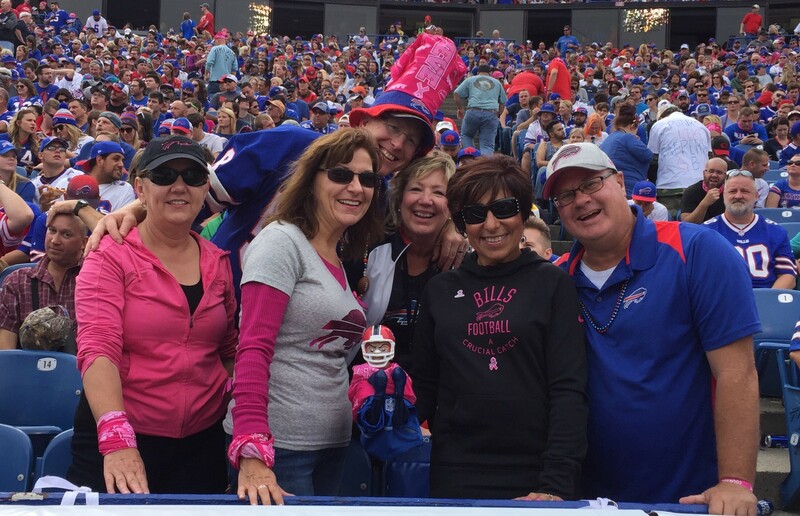 Over the course of his membership, Penna has made many fond memories while attending Bills games and has even forged lasting relationships. While he’s had several exciting experiences, one that he’ll never forget is meeting his wife. After some words of encouragement from his dad, Penna introduced himself to her and the two hit it off. Although it’s hard to top this memory, Penna has a few other favorites, including The Comeback Game and the recent snow game against the Indianapolis Colts. Through the years, Penna has enjoyed watching some of his favorite players take the field. From running back Thurman Thomas to defensive tackle Kyle Williams and quarterback Tyrod Taylor, he’s loved every moment. Nowadays, Penna shares his passion for the team with his family and views Sundays as an opportunity to spend quality time with them. A fireman for 17 years, Penna and company can be seen on game day wearing firemen helmets. For each Bills game, the group makes their way to Buffalo on Saturday so they can visit with Penna’s mother-in-law, who lives in Blasdell, prior to cheering on their favorite team. The Buffalo Bills would like to thank Nicholas for his many years of being a loyal Bills Season Ticket Member and our Season Ticket Member of the Month for the month of February. In addition to Nicholas being selected as a Season Ticket Member of the Month, he will receive a club seat upgrade, an autographed item and select Bills merchandise. This year, the Buffalo Bills once again proudly teamed up with Republic Services to make a significant impact on the environment. 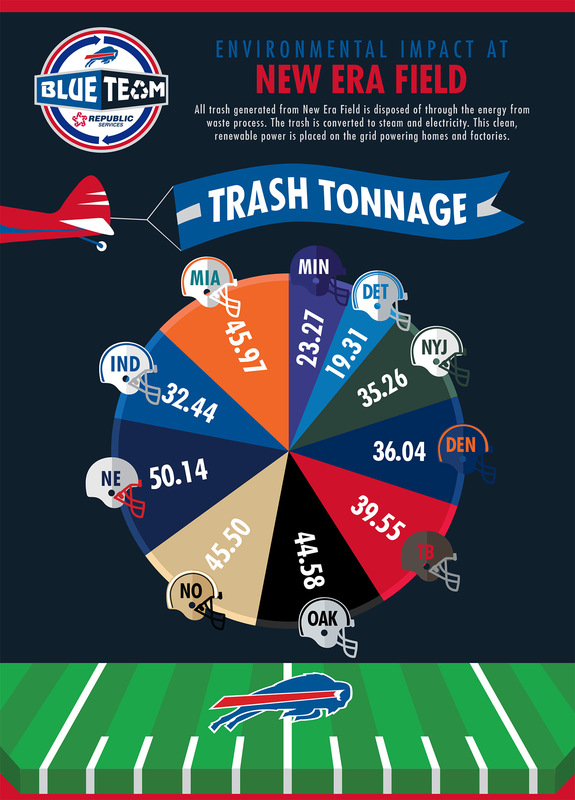 At each home game during the 2017-18 season, the Republic Services Blue Team collected the trash generated at New Era Field and converted it into a clean and renewable power source, such as steam and electricity. From there, the energy was used to power homes and factories in the area! This remarkable process generated 204,635 kilowatts of renewable electricity, which was enough to power 214 homes for one month. It also saved 15,626 gallons of fuel and avoided 372.06 tons of greenhouse gases from being emitted. For more stats on how the Bills and Republic Services made a positive impact this year, click here. From a small town named Albion, located in-between Buffalo and Rochester, lived a Bills fan like no other. While her peers played on the playground, Erica Kuntz attended Bills games playing in the aisles with the children surrounding her families Season Ticket Member seats. She grew up immersed in Buffalo football, cheering weekly for the team her family still loves and cherishes today. The tradition of attending Bills games first began when her grandfather purchased Season Tickets in 1984. Since then the tickets have been passed from generation to generation, beginning with her mother and then about five years ago being passed to her. 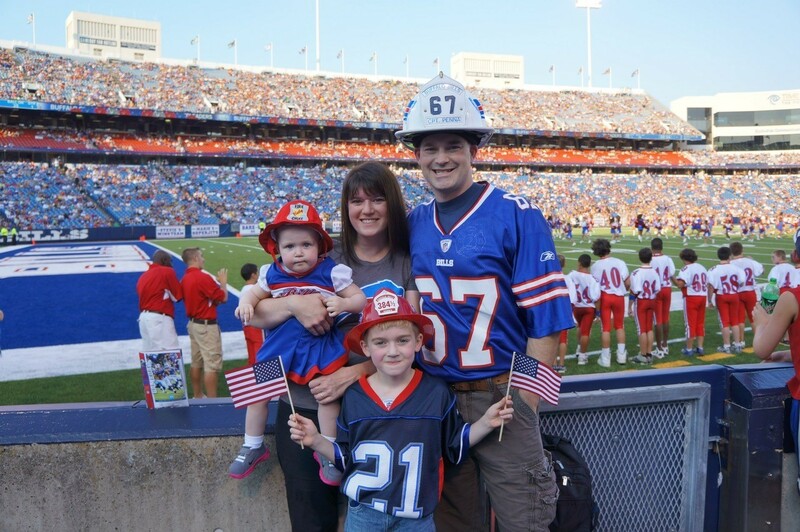 When visiting New Era Field for current games, Kuntz brings her three-year-old daughter, keeping the family tradition of Bills football alive. As a young girl, Kuntz favored the defense particularly her all-time favorite player, defensive end Bruce Smith. While personnel have changed throughout the years, her love of defense remained the same, cheering these days for defensive tackle Kyle Williams. As one could imagine, Kuntz has several tailgate rituals. In order to make game days feel right, Kuntz always drives her car which proudly showcases her Bills love with a custom-made license plate. After arriving at the field, Kuntz enters the gates early to watch her favorite team warmup and prepare for another one-of-a-kind day at New Era Field. As a Season Ticket Member, Kuntz has gotten to experience a behind the scenes look at Bills football and even announced a draft pick! “As a Season Ticket Member, you get to go even beyond just watching the game and kind of see the inner workings of what is going on,” stated Kuntz. The Buffalo Bills would like to thank Erica for her many years of being a loyal Bills Season Ticket Member and our Season Ticket Member of the Month for the month of January. In addition to Erica being selected as a Season Ticket Member of the Month, she will receive a club seat upgrade, an autographed item and select Bills merchandise. 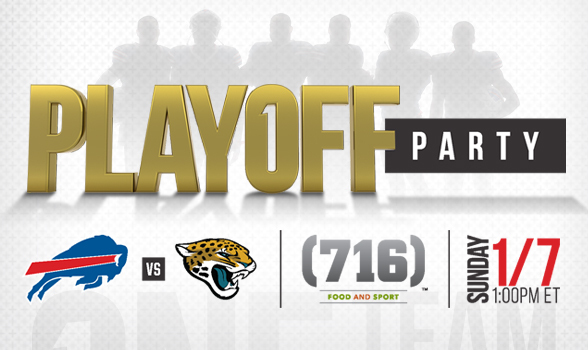 Bills fans, put on your favorite game day gear and join the Playoff Party this Sunday, Jan. 7, at (716) Food and Sport! To celebrate the Buffalo Bills making it to the postseason, (716) will have a DJ and prizes to be given away during the team’s 1:05 p.m. ET Wild Card game against Jacksonville. * Fans can enjoy huddling together to cheer on the Bills, while eating some of Buffalo’s favorite dishes. The one-of-a-kind restaurant features a 38-foot screen for the ultimate game day experience. *Please view the official rules here.